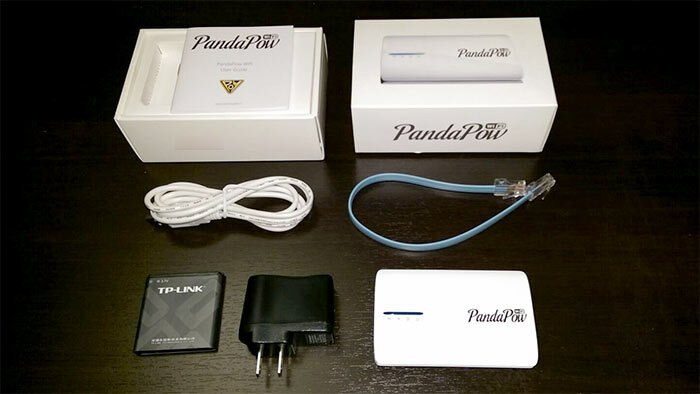 PandaPow WiFi is a VPN router offered by the VPN provider PandaPow. In this review, we will cover features, speed, prices etc. for this VPN router. In addition, we will talk about what is a VPN router and discuss the pros and cons of using this VPN router. Can connect to the Internet via a Ethernet cable or connect to a 3G network using a USB dongle. Can also connect wirelessly to an existing Wifi network. Size is small and can be powered by battery, thus can be used outdoor as a pocket Wifi. Supports filters to exclude websites or IPs for VPN coverage. Might not be powerful enough for use in a big house or a large office. Price: USD $99 (Comes with 15 months of VPN subscription, which can be renewed for $99/year). Shipping: Free shipping to Mainland China and Hong Kong. $20 for other countries. In short, a VPN router is a wireless router with built-in VPN support. Once VPN is turned on, all devices connected to a VPN router will be covered by VPN. Therefore, you don’t have to install any software or app on those devices to use VPN. A VPN router is a convenient solution if you want to use VPN on devices that can’t set up VPN easily, such as Xbox, Playstation, Apple TV and Chromecast etc. Also, with a VPN router, you are no longer limited by your VPN provider on the number of simultaneous connections. All connected devices can use VPN at the same time. Although you can use a VPN router as the only wireless router in your home or office network, many people choose to use it as a secondary router that is connected to a “normal” router that’s not VPN-enabled. This way you will have two Wifi networks to choose from: one with VPN and another without. As a result, you can easily enable or disable VPN by switching Wifi networks. One can set up a VPN router by “flashing” a compatible regular router with special firmware, which requires some technical skills and might not be easy. Alternatively, you can purchase a router with VPN built-in such as the PandaPow Wifi VPN router. PandaPow is a VPN provider based in Hong Kong. It has VPN servers in many countries, including USA, UK, Canada, Australia, France, Germany, Hong Kong, Japan, Netherlands, Russia, Singapore, Sweden and Thailand etc. PandaPow offers two major products: PandaPow Classic, which is its “normal” VPN service, and PandaPow WiFi, which is a Wireless VPN router. For the PandaPow WiFi VPN router, the price is $99/year. When you order the router, you pay $99. You will receive a router along with a VPN subscription account, which is valid for 15 months. After the first 15 months, you can renew the VPN subscription for $99/year (no need to pay again for the router itself). 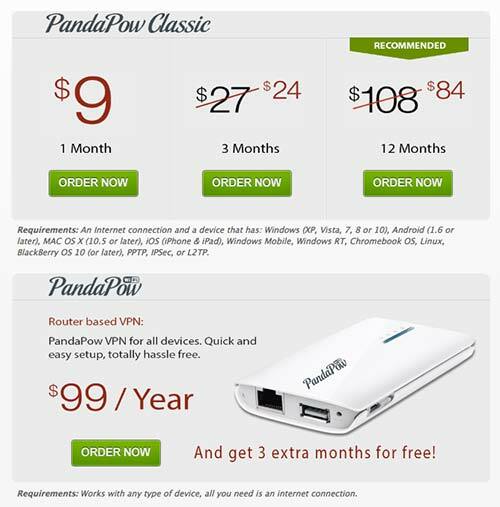 PandaPow offers a 7-day money back guarantee for both its PandaPow Classic service and its VPN router. The PandaPow Wifi VPN router is quite small. Its size is similar to a cigarette pack. The exact dimensions are: 43mm (width) by 25.88mm (height) by 91mm (length). Its weight is 86g. The router has one WAN port for connecting to the Internet via a Ethernet cable and a USB 2.0 port that can be used for connecting to a 3G network using a 3G dongle. For wireless, the router supports IEEE 802.11a/b/g/n with a maximum transfer rate of 150 Mbps. The PandaPow Wifi VPN router has a built-in 2600 mAh battery, therefore you can take it outside (for traveling or working in a cafe etc.). The battery can last 7-8 hours on a single charge. This router can also be used as a power bank to charge other devices such as a mobile phone. PandaPow offers free shipping for customers in Mainland China and Hong Kong. For other countries, the shipping price is $20. After the order was placed, it took 2 days for us to receive the VPN router at our Beijing address. The router was shipped from Hong Kong via S.F. Express. PandaPow provided a shipping tracking number to us and we were able to track the shipping process before it arrived. We have a a primary router that’s connected to the Internet. We connected the PandaPow VPN router to a LAN port of our primary WIFI router as a secondary router. PandaPow provided a default SSID as well as a login username and password inside the box. After we have connected to the VPN router to the Internet, we then followed the instructions and visited a special URL on our browser to login the VPN router’s admin control panel. In the router control panel, we were able to change the SSID as well as the username and password. You can also change to use different VPN server locations in the control panel. 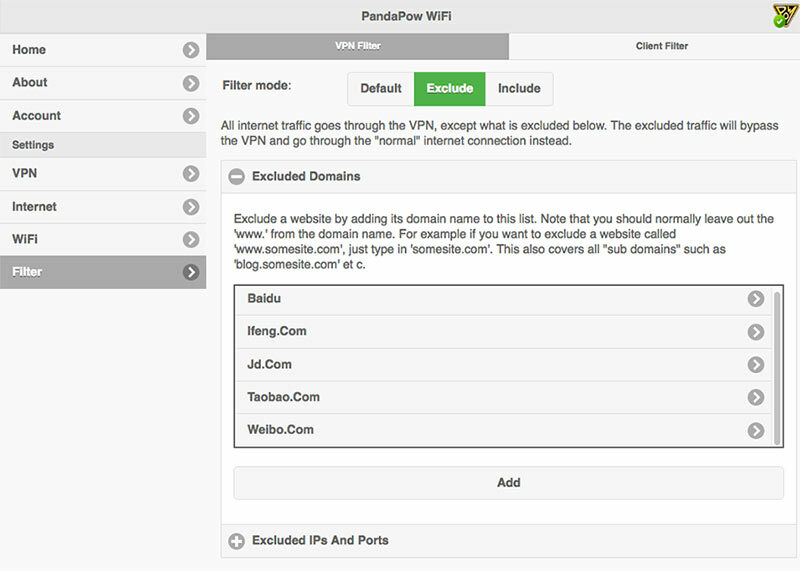 One nice feature about PandaPow’s VPN router is that you can set up filters so that you can specify which websites or IP addresses do not need to go through VPN (or the other way: which websites or IPs need to go through VPN). For Internet users in China, they can use the “Exclude” mode to filter out local websites such as Weibo, Taobao, QQ etc. so that those websites can load at the normal speed without going through VPN. Does the PandaPow Wifi VPN router offer fast speed? To answer this question, we used SpeedTest.net to measure speed after turning on VPN on this router. We tried connecting to PandaPow’s VPN servers in different countries and found out the fastest servers (we are testing from Beijing, China) are the ones located in Hong Kong. Some servers in Japan also had good connection speed. Download Speed: 6.91 Mb/s. Upload Speed: 4.52 Mb/s. Ping: 82 ms. Using the PandaPow Wifi VPN router, we were able to watch HD Youtube videos smoothly from China without any problems. 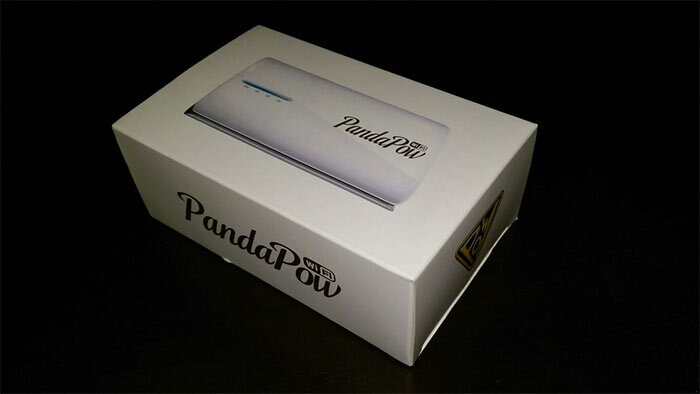 The PandaPow Wifi VPN router is a compact Wifi router with VPN built-in. It works in China with decent speed. It can connect to the Internet via a Ethernet cable or connect to a 3G networking using a USB dongle. It can also connect wireless to an exiting Wifi network as a extender with VPN enabled. It allows many devices to share VPN at the same time and it’s a good solution if you need to use VPN for devices such as Xbox, Playstation, Apple TV and Chromecast etc. With its filtering option, users can filter out websites that do not need to go through VPN. With a built-in battery that can last 7-8 hours on a single charge, this VPN router can be taken outdoor as a pocket wifi, which will be convenient for anybody want to use VPN while traveling or working outside. If you are looking for a VPN router, you can consider the PandaPow Wifi VPN router. This entry was posted in VPN Reviews and tagged pandapow, review, router. Bookmark the permalink.